Pass the Fried Okra, Uncle Sam! Think kids hate their veggies? Seems grown-ups aren't much better. That's how things look based on a report by the CDC (Centers for Disease Control & Prevention). It doesn't seem as though any of us are even close to eating the recommended daily allowance of fruits and vegetables. Pass me the Fried Okra! Oh, no! I live in Oklahoma! Yes, I'm a transplanted Okie (“Lovin' It!” says Ronald McD). Less than 10% of folks in OK, MS, AL and SC supposedly eat the recommended 5-9 servings of fruit and vegetables per day. For the majority of Americans, our favorite “fruit” is orange juice and the humble potato is our favorite vegetable. Fries and OJ. Starch and sugar, and not a lot of nutrients. Hey, don't forget the tomato! Oh yeah, ketchup (in a handy squeezable mini-tube). 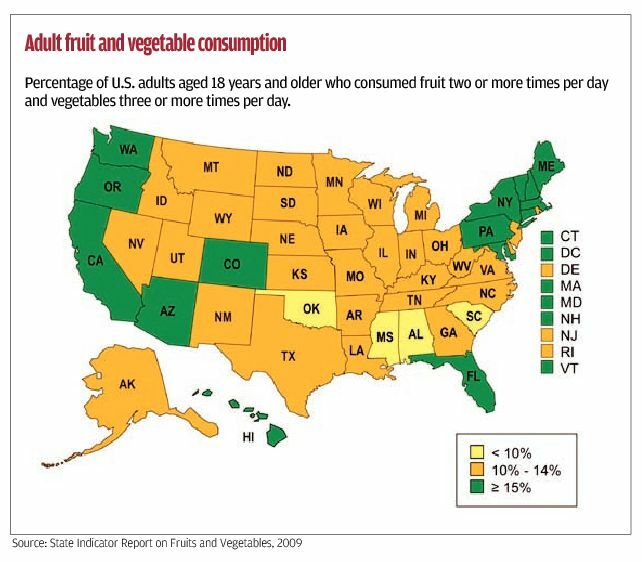 Okay, someone must be counting, because the CDC says that only about a third of American adults eat two or more servings of fruit per day, and just over a quarter of us eat three or more servings of vegetables. So for most of us, an apple and some lettuce is about all we can manage (if that) every day — not even close to the recommended daily amounts. How can we get the nutrition our bodies need? 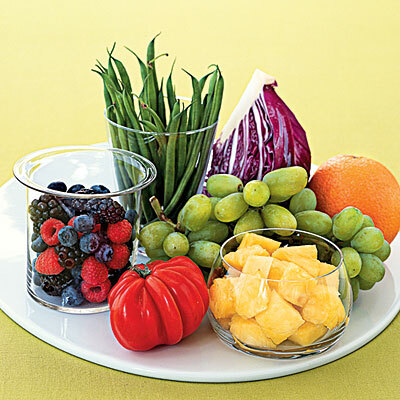 Get ready to SEE what the recommended daily servings of fruits and vegetables look like. Here is the recommended daily amount of fruit and vegetables: 2 1/2 cups of vegetables and 2 cups of fruit – total per day (1 1/2 cups of fruit if over age 30). The USDA counts 1/2 cup as a full serving. That's about how much fruit and vegetables most Americans eat per day (not good). HOW do we make up the difference? 1. Take good whole food supplements.